Your body is a hive of nested complexity. Consider all it does — it sees, smells, thinks, walks, runs. And this list is just the start. All of this activity is made possible by exquisite organs — eyes, olfactory bulbs, the brain, and muscles. Beneath these lie specialized tissues, comprising trillions of cells, themselves composed of innumerable organelles and chemical building blocks. Since Watson and Crick’s seminal discovery of DNA structure, we have known that this unfathomably elaborate arrangement is directed by our genes. The recipe for building your body — and for keeping it running — is written in the nucleotide sequence of your DNA. These are the As, Cs, Ts, and Gs that sound familiar to us because of high school science classes. But how can four simple molecules build things as complicated as whales and trees and you and me? The answer lies in the structure of the genetic code. The nucleotide bases of DNA constitute its alphabet, but as in any language, the real heavy lifting is done by words. The genetic equivalent of words are codons, strings of three nucleotides interpreted as a single unit. Each codon specifies an amino acid, one of the building blocks of proteins. In turn, proteins interact to build humans. The genetic lexicon is well-known to biologists. Sixty-four codons encode 20 so-called canonical amino acids, and this system permeates through all of life. But as with many rules, this standard genetic code may allow exceptions. Recently, researchers at Yale and at the University of Western Ontario have shown that the picture is not quite as simple as we would like to believe. It has actually been known for some time that the genetic code can vary from one organism to another. In rare instances, scientists have found codons specifying amino acids that fall outside of the 20-member canon. Think of these as new slang, featured in the vocabulary of some organisms but not others. Although such innovations have been previously recognized, what they might mean for the evolution of the genetic code remained unclear. Now, thanks to research conducted in the lab of Dieter Söll, Sterling professor of molecular biophysics and biochemistry at Yale, scientists are beginning to grasp the significance of these new words. Patrick O’Donoghue, Canada research chair, assistant professor biochemistry and chemistry at Western University, and lead author of the study published in the Proceedings of the National Academy of Sciences, explained his team’s primary interest. What they wanted to know was how organisms use these new translations. The team chose to look at an amino acid called pyrrolysine, which is extremely rare. “It’s found in fewer than one percent of sequenced genomes,” O’Donoghue said. 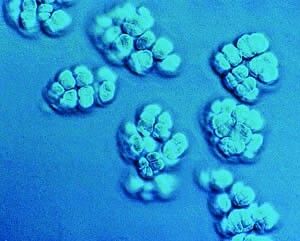 Methanosarcina acetivorans, a microbe in the kingdom Archaea, is one of only a few organisms to encode pyrrolysine. Image courtesy of the Broad Institute. Methanosarcina acetivorans uses its pyrrolysine in proteins that are important for making methane. Prior to the Yale study, most researchers assumed that this was pyrrolysine’s only function. Many imagined it to be a fluke — an unusual amino acid incorporated to make methanogenesis happen. “Everyone assumed that this was one amino acid, incorporated into only one protein, for just one purpose,” said Ilka Heinemann, a co-author of the paper and assistant professor of biochemistry at Western University. But Söll’s group suspected that pyrrolysine might be up to more than that. To find out what else it was capable of, they struck its code, eliminating it from the archaea’s genetic dictionary. To achieve the knock-out, the team engineered a strain of the microbe that could no longer translate the stop codon, UAG, into pyrrolysine. The researchers took advantage of transfer RNA, molecules that equate codons and amino acids. By deleting the transfer RNA for pyrrolysine, Söll’s group manipulated organisms to revert UAGs back to stop codons, and to rid their cells of pyrrolysine altogether. Then, researchers looked at the total collection of proteins made by the altered microbes to see what had changed. What they found was completely unexpected. “We were very, very surprised,” Heinemann said. If pyrrolysine was simply working in one protein with one function, as some scientists thought, the deletion should not have affected much. But Söll’s team observed changes galore. Pyrrolysine was at work in many proteins where it was previously unknown to exist. Even proteins without the amino acid were expressed differently in its absence. A simple experiment had opened up a host of new questions. Like any good scientist, O’Donoghue was excited. “We were jumping up and down with joy,” he said with a laugh. Next, the researchers set out to determine what the changes in protein composition would mean for the microbe’s survival. Again, the results were dramatic. Whereas the unmodified microbes grew well on a diet of chemicals such as methanol or trimethylamine, without pyrrolysine in their arsenal of amino acids, they showed stunted growth on methanol and no growth at all when fed trimethylamine. The deletion of pyrrolysine, the scientists found, shifted the entire metabolism of the cells. This discovery sheds light on an even bigger question: Why do organisms almost universally encode 20 amino acids? Why not 19? Or, like Methanosarcina acetivorans, 21? Francis Crick, on the discoverers of the DNA double helix, offered one likely answer. Crick reasoned that the genetic code should be strongly conserved, since any change in the translation would have tremendous effects on how cells and bodies are built. And there is a good chance that these changes would be disastrous. Imagine taking your favorite novel and replacing words at random, or deleting every occurrence of the word “the.” This kind of blind editing is not likely to improve the story. While Crick’s logic was compelling, nature has shown us that changes in the genetic code can catch on. Since the code is redundant, new translations can be added without displacing old ones. And, as Methanosarcina acetivorans reveals, every once in a while these innovations will stick. Once Methanosarcina acetivorans began to use pyrrolysine in its core metabolic processes, it became committed to the new amino acid. Söll’s group showed that the microbe can still get by without pyrrolysine, but at a steep cost. The organism survives by modulating its core metabolism. This change, which may represent a reversion to an ancestral state, allows the microbe to use food sources and metabolic pathways that do not require pyrrolysine. But as part of the deal, it has to give up some of its favorite foods. Presumably, with enough time, Methanosarcina acetivorans might lose the ability to switch metabolisms altogether. Pyrrolysine may transform from an unusual slang word into a central part of this organism’s genetic vocabulary. Scientists have begun to copy Methanosarcina acetivorans’ strategy for modifying the genetic code in hopes of better engineering proteins and organisms. By co-opting stop codons, researchers can build proteins with all manner of non-canonical amino acids. In fact, Methanosarcina acetivorans’ system for turning a stop codon into a pyrrolysine has already been successfully transplanted into bacteria. “It’s been extremely useful,” O’Donoghue said. “By now it’s been used to incorporate [more than] 100 non-canonical amino acids.” This ability to rewrite the genetic code could allow scientists to produce new drugs or materials, and O’Donoghue believes that it will find important applications in basic research as well. Researchers might use rewriting to insert tiny fluorescent tags into proteins, for example. “This could give you a great way to label proteins and see where they go,” O’Donoghue said. Right now, scientists must resort to large, clumsy labels to do this sort of research, and they run the risk of interfering with the processes they are trying to observe. A ball-and-stick model represents the amino acid pyrrolysine, which is excluded from the genetic code proper. Image courtesy of Wikimedia. The Yale study might portend problems for these efforts, though. In order to rewrite the genetic code, biomedical engineers must delete the function of a codon to free up space for a new translation system. And Söll’s experiment shows us that deleting part of the code — even a part that seems unimportant — can have wide-ranging consequences. If the deletion of just pyrrolysine can trigger a shakeup of a cell’s protein arsenal, it seems unlikely that other amino acids can be removed without an avalanche of side effects. Still, Heinemann remains optimistic. “It’s a challenge, but I wouldn’t call it a setback. Because it’s always better to know what the challenges are,” Heinemann said. Of course Methanosarcina acetivorans has revealed more than just obstacles for biotechnology. The work that Söll, O’Donoghue, Heinemann, and others have done on the humble microbe will change how we think about the genetic code. Crick’s view of the code as static and universal has been replaced by a more dynamic picture. The genetic code is undoubtedly under intense selection pressures, but when these pressures line up just right, the code can, in fact, change. Even small changes can mean big effects for an organism. The study that came out of Söll’s lab represents an important step forward in understanding these effects. Although it is crucial to understand the way in which genes are written, nucleotide sequences are just the beginning when it comes to understanding exactly how organisms are built. The story of pyrrolysine shows us that life is made — and lost — in translation. Cover Image: Art by Alex Allen. About the Author: Zach Miller is a sophomore in Saybrook College studying ecology and evolutionary biology and applied mathematics. He studies the ecology and evolution of Greek lizards with professor Oswald Schmitz and Colin Donihue. Acknowledgments: The author would like to thank Patrick O’Donoghue and Ilka Heinemann for their clear and enthusiastic explanations of their research. Further Reading: “Reducing the genetic code induces massive rearrangement of the proteome” Patrick O’Donoghue, Laure Prat, Martin Kucklick, Johannes G. Schäfer, Katharina Riedel, Jesse Rinehart, Dieter Söll, and Ilka U. Heinemann. PNAS. 2014.